I’ve never liked the word “casserole”. I’m not sure why, but I just can’t wrap my mind around it, and “hot dish” doesn’t really do it for me either. Whenever I hear the word “casserole”, images of condensed soup drowned food enters my head. However, the casserole is actually quite wonderful and so many recipes these days don’t include condensed soup, so I’m trying my best to loosen up and make more. After all, they are marvelous for feeding a crowd, and my family qualifies as a crowd with 3 teenagers, a young adult and two parents. 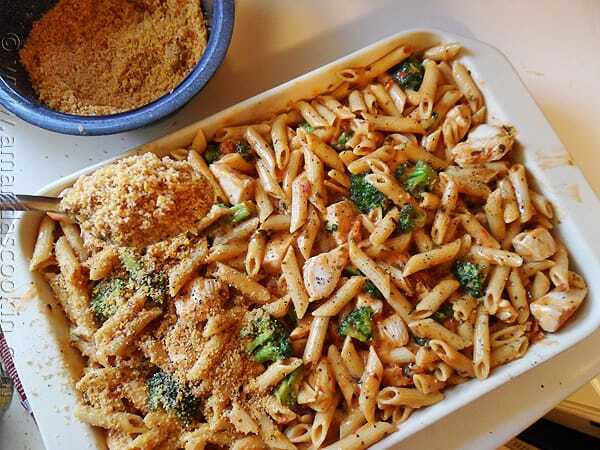 When I spotted this baked penne with chicken, broccoli and smoked gouda on Mel’s Kitchen (a fellow Wisconsin blogger) and read the ingredient list, I knew it would be something I enjoyed. I adapted it to fit what I had in the kitchen and it was absolutely delicious. I used 1% milk instead of heavy cream, which worked just fine, and substituted smoked gouda for her smoked mozzarella. I’m sure I could have found the smoked mozzarella, considering I live in Wisconsin, but I absolutely love smoked gouda so it was an easy choice. This is a wonderful recipe for Sunday dinner. It’s amazing how far a box of pasta can stretch 3 chicken breasts and actually serve 8 hungry mouths. Definitely worth a try, I will be making this again. In a small bowl, toss together the bread crumbs and butter and set aside. Spray a 9X13-inch baking dish with cooking spray and preheat the oven to 400 F.
In a large stock pot, bring the water for the pasta to a boil. Stir in one tablespoon salt and the broccoli. Cook the broccoli for 1 minute, it will be bright green. Remove the broccoli with a slotted spoon to a plate. Return the water to a boil and add the pasta and cook until al dente. Drain the pasta and toss with 1 tablespoon olive oil. Set aside. In a large saute pan heat remaining olive oil over medium flame. Add the onion and cook until softened, about 5 minutes. Stir in the garlic; cook until fragrant, about 30 seconds. Add the flour, salt and pepper, and cook, stirring constantly, until golden, about 1 minute. Whisk in the broth and milk then add the fresh thyme leaves. Simmer, whisking often. Add chicken and cook, stirring occasionally, until cooked through, about 6-7 minutes. Stir in the sun-dried tomatoes and smoked gouda. Add the prepared penne pasta and broccoli to the sauce; stir to combine (use a separate bowl if you need the room). 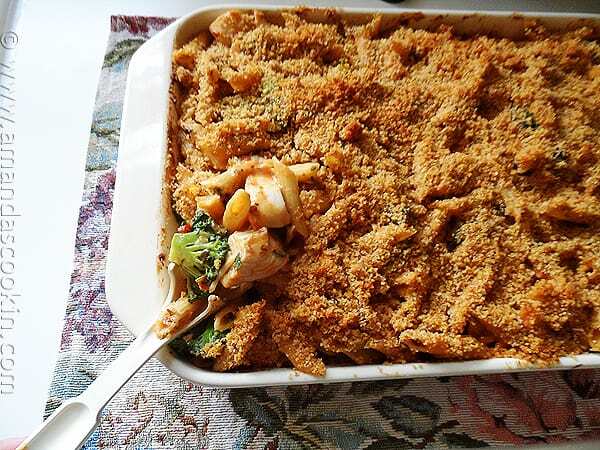 Transfer to the prepared baking dish and sprinkle with the bread crumb topping. Bake until bubbly and crumbs are golden, about 15 minutes. Serve immediately. 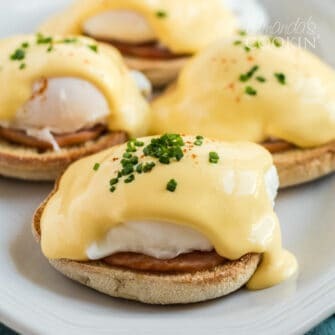 Amanda, I fell in love with this recipe. I made it for a few coworkers and myself, I received raving reviews. The smoked Gouda made this recipe for me. The only thing that I would change the next time is the chicken. I didn’t love the texture of the chicken when it was cooked this way. I’m thinking shredded chicken next time? I’ll let you know. Thank you for sharing. casserole, casserole, casserole, casserole, casserole, casserole. Haha sorry. This “casserole” does look fantastic though! I like penne and breoccoli! oh my gosh, this sounds so delicious! wow you definitely are feeding a crowd! gorgeous pics! The word ‘casserole’ has always put me off too. Glad to see that I’m not the only one. Your dish looks tasty, so plan to give it a try. Hi Amanda! 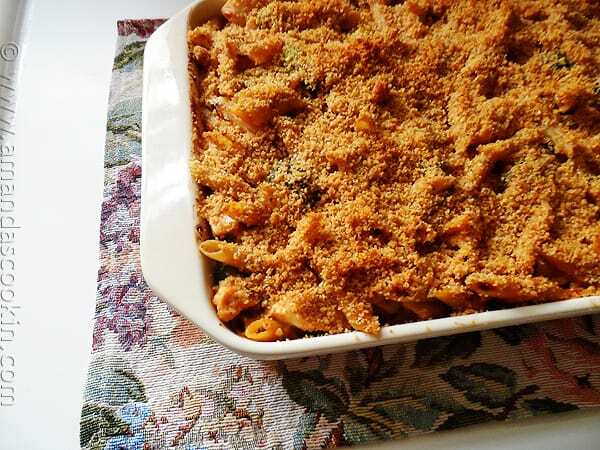 I’m so happy you liked this recipe and think the smoked gouda would be a divine substitution. Also, that’s fantastic that 1% milk worked just as well for the cream. Love that! It’s fun to connect and hear from other Wisconsin bloggers so thanks for the comment! Thanks Mel! It’s always fun to find others in my neck of the woods, you have a beautiful blog! I am not sure I am keen on the word “casserole” either-never thought about it, until I saw your post. I getting ready to do a menu plan for the week ( an attempt to organize my disorganized eating week). I am thinking I have most of he ingredients for this dish-going to make it. I love the sound of this recipe. The smoked Gouda was the thing that grabbed me however! 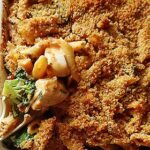 I also love the thick layer of homemade breadcrumbs you added on top. Next to the Gouda, that would probably be my favorite part! Looks like a real rib sticker. Thanks Amanda! I know! Smoked gouda is the bomb :) Thanks Renee!